Fiji Football Association received a sponsorship deal of $5.5m over the next five years from Vodafone Fiji yesterday. Vodafone Fiji chief marketing officer Rajnesh Prasad reaffirmed its alliance with Fiji FA to take the sport to the next level. “We are proud to be part of Fiji FA for another five years at all levels including schools, youth, women, district and national teams. “This sponsorship reflects on our commitment to develop football at all levels and raise the profile of players in the country,” Prasad said. “Our youngsters now have the opportunity to shine and pursue the sport further with our support towards the primary and secondary schools competitions,” he added. “The future is definitely exciting, and I am certain that with this support we will help shape the future stars in football,” he added. 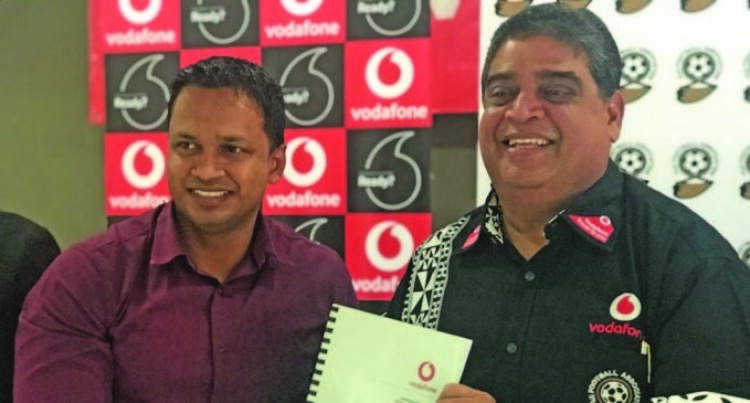 Fiji FA president Rajesh Patel welcomed the support from Vodafone. “We are expanding our development centres and this is only possible through Vodafone’s sponsorship. We are grateful that Vodafone continues to support Fiji FA,” Patel said.